"Come to a braai" means barbeque time in South Africa. Sosaties are classic fare at braaivleis, or outdoor grill. Traditionally, a braai was considered complete with just sosaties, freshy-baked bread, and the large, round sausages called boerewors (literally, Boer sausage). 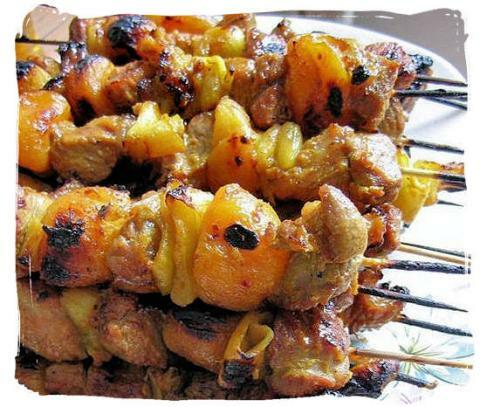 You must begin preparing the sosaties 12-14 hours ahead of time. Rub the lamb with garlic, then cut it into bite-size cubes. Place the pieces in a dish and sprinkle them with salt and pepper. Meanwhile, fry the onions in oil until golden. Stir in the coriander, cumin, and curry powder, followed 2-3 minutes later by the brown sugar, lemon juice and jam. Add 1/2 cup water. Bring to a quick boil, stirring constantly. Remove from heat. When the mixture is thoroughly cooled, pour it over the meat, stick in the bay or lemon leaves, then cover the bowl and refrigerate overnight or at least 12hours. The lamb will cook in 10-15 mns. While the meat grills, transfer the marinade to a heavy pot, first removing the leaves. Bring to a boil. For a thicker sauce, spoon out a bit of the hot liquid to blend with flour. Whisk into a smooth paste and stir gradually into the pan. Pass sauce separately to pour over the meat.